Every single element is presented on Mendeleev’s table along with a host of useful information, images, videos and podcasts. See the trends and patterns that make up the table and quickly compare elements to one another. It’s all there and it’s free! 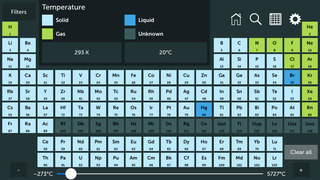 The Royal Society of Chemistry has transferred their Periodic Table website to an app version that is available for both mobile and tablet devices. The transition does well to include all the extensive interactive features. A huge amount of information is made available for every single element and is presented in a logical and attractive manner. Each element also has links to its matching YouTube video by Brady Haran and a relevant podcast by the Naked Scientists. To get full access these pieces of media an Internet connection is needed. By tapping on any of the elements some of the basic details are displayed with photos. Further information can be accessed by tapping on the ‘i’ icon, and the depth of this information depends on the original settings; introductory, intermediate and advanced. A helpful feature in this view is that some key terminology is underlined and when tapped a definition appears. Navigation is intuitive with appropriate uses of icons and there is a simple search feature too. While viewing information about one element, its neighbouring elements are displayed as small icon around it for quick access. Metals, non-metals, groups, periods and blocks are easily viewed with supporting text. A timeline appears at the bottom of the screen when you tap on the ‘history’ title and as the slider is moved from 0 AD to Today the elements that have been discovered become highlighted. A similar function is used for ‘temperature’ with the elements being highlighted as solid, liquid or gas as the slider is moved from 0 degrees kelvin to over 5000 degrees kelvin. The app has integrated some convenient comparison options for all the elements that are quickly accessed through tapping on the ‘trends’ title when viewing the whole table. For example elements with a high boiling or melting point will be displayed with their space on the table in full colour, while those with low points will have no colour. As well as temperatures, this can be done for atomic radius, density, electronegativity, supply risk and first ionisation energy. This comparison can be done as a general comparison or a more specific and detailed comparison by tapping a grid icon on the menu tab on the side of the screen. Initially all elements are displayed in a table with numerical data of the comparison headings mentioned above. The elements can be instantly sorted in order from highest to lowest by tapping on the appropriate heading. What’s more individual elements can be selected and compared against each other. 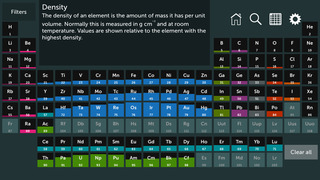 It’s quite clear that the Periodic Table app has gone to great lengths to make this a functional app without compromising on the high quality and high quantity of content. It can serve as both a research hub and a teaching tool to display trends and patterns within the table. This isn’t a unique app, in fact there are many similar versions by other developers out there, however The Royal Society of Chemistry have produced such a comprehensive app (available for free!) that it becomes an obvious choice for any science student or teacher. 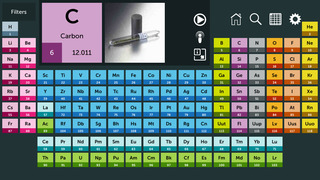 This fact-filled, image-rich app is the only periodic table you need. 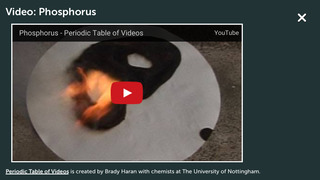 Ideal if you’re a student, teacher or just have an interest in the chemical sciences. Did you know that neodymium is used in microphones? Or europium in Euro bank notes to help stop counterfeiting? These are just two of the absorbing facts in our customisable app, based on our popular and well-respected Royal Society of Chemistry Periodic Table website. •	See elements in their natural state and real-life applications. •	Check out podcasts and videos. 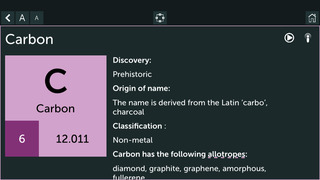 •	Use our interactive slider to see how elements change state as temperature increases, or explore the discovery of the elements through history. •	Customise your app to see only what interests you. •	Use our simple table for quick access to data – like sorting elements in order of increasing density.